Special Containment Procedures: SCP-1961 is stored in Research Bay 12 at Site-22, under standard keycard-level security. SCP-1961 is only to be used for experiments on D-Class Personnel, with the approval of Level 3 or higher research staff. Conversion of other Foundation staff is suspended by O5 order, as are requests for SCP-1961 usage by any non-Foundation organization, regardless of clearance level. Any person processed through SCP-1961 is considered an instance of SCP-1961-1. Merged instances of SCP-1961-1 become SCP-1961-2. Containment staff should be aware that while SCP-1961 itself is Safe, SCP-1961-1 and SCP-1961-2 are Euclid Class. If it is necessary to terminate a specimen of either SCP-1961-1 or SCP-1961-2, fire or dissolution in acid are the recommended means. Personnel guarding SCP-1961-1 or SCP-1961-2 will therefore be issued flamethrowers. SCP-1961-1 subjects are required to wear Type 47-B Containment Suits when in the presence of Foundation staff, other instances of SCP-1961-1, or any instance of SCP-1961-2, unless direct exposure is required for experimentation. D-Class Personnel converted to SCP-1961-1 are exempt from monthly termination, but subject to all other D-Class restrictions, and should be considered a higher escape risk. SCP-1961-2 specimens acquire greater strength in proportion to their size, and larger subjects should be handled with appropriate caution. Converted Foundation staff should be considered of questionable loyalty and subject to Security Protocol 10-C. 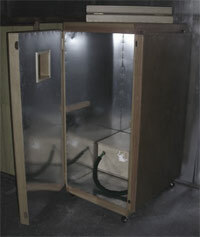 Instances of SCP-1961-1 and SCP-1961-2 are contained in a standard maintenance/restraint area for live specimens. Description: SCP-1961 is a 2.5 m x 1.5 m x 1.5 m mirrored booth, composed of wood, steel, and [DATA EXPUNGED]. It is designed to emit a mixture of ████████ and ██████ radiation and concentrate the rays on a human subject, previously injected with [DATA EXPUNGED] and processed SCP-2408-1 blood. [See Document 1961-P-3 for synthesis and administration instructions.] Use of SCP-1961 is fatal to subjects who have not been prepared with the appropriate injections. SCP-1961 processing is not reversible. The intent of the procedure is to give the treated subject the power to modify his/her physical form at will, and maintain the change voluntarily for an indefinite period. The SCP-1961 procedure is only partially successful. 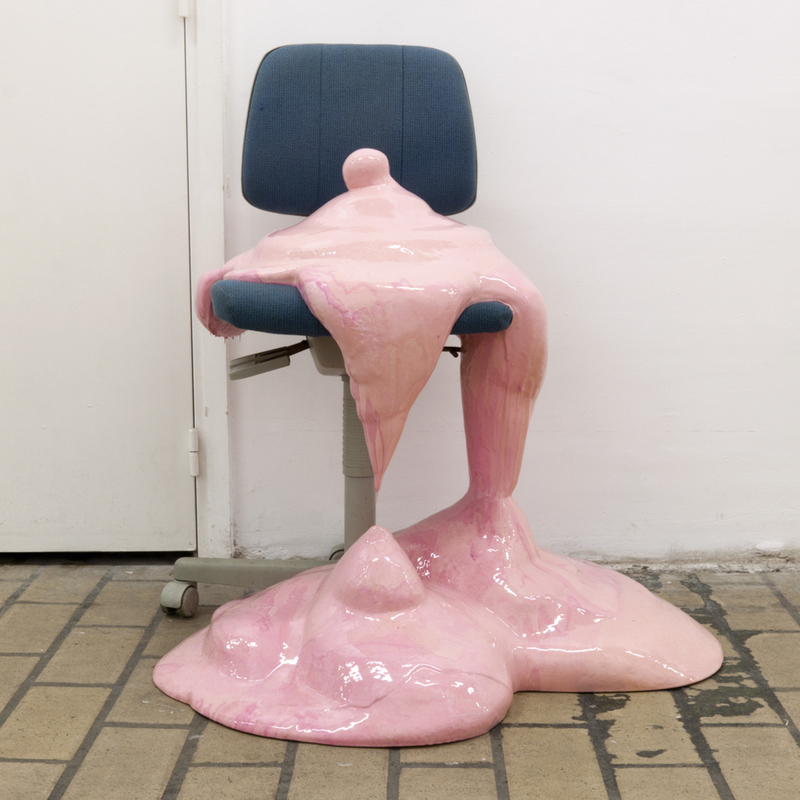 Treated subjects (hereafter referred to as SCP-1961-1) adopt an amorphous form, composed of their original mass, converted to a substance resembling protoplasm. Despite the lack of recognizable vital organs, SCP-1961-1 subjects retain their intelligence and personality in their new form. SCP-1961-1 subjects can learn to shape themselves into any form that conserves mass; this is not an innate skill, and there is wide variance in talent among individual subjects (approximately 40% have eventual success in simulating a human form). SCP-1961-1 subjects may assume the form of non-human or even anomalous beings, however they gain no additional strength or special abilities when doing so. Form conversion is physically tiring, and SCP-1961-1 subjects have not been able to retain human form for a period longer than four hours, requiring at least eight hours in amorphous form before another attempt can be made. Subjects are also likely to lose cohesiveness when angry, startled, or forced to concentrate deeply on another task. SCP-1961-1 subjects are typically contained within waterproof environmental suits. This prevents unauthorized interactions between specimens, as well as allowing subjects to maintain a somewhat human appearance (and a fully human appearance by learning to convert their head and hands). SCP-1961-1 subjects can merge with each other to form larger amorphous forms, designated SCP-1961-2. The merger process is voluntary, but apparently not reversible. It is unknown how many individuals can merge into an SCP-1961-2 colony; the largest under containment has ██. Theoretically, there is no limit to the size of an SCP-1961-2 specimen. SCP-1961-2 colonies lose the ability to transform into recognizable forms, and either cannot or will not communicate with Foundation personnel. SCP-1961-1 subjects can silently communicate with SCP-1961-2 specimens by unknown means, and claim that SCP-1961-2 specimens are in a "state of communion" and retain aspects of their intelligence. A complex set of relationships between SCP-1961-1 and SCP-1961-2 subjects has developed, poorly understood by Foundation researchers. SCP-1961-1 subjects have been notably uncooperative in explaining this aspect of their development. Due to the lack of blood and vital organs, both SCP-1961-1 and SCP-1961-2 specimens are substantially more resistant than humans to trauma and hostile environments. Although initially developed for espionage activities, SCP-1961-1 specimens have been under consideration for both combat activities and exploration of areas difficult for humans to safely access. If they can be adequately controlled, SCP-1961-2 specimens may be suitable for manual labor in similar environments. Analysis of SCP-1961-1 and -2 cellular structure suggests specimens should be capable of reproduction through binary fission, however no specimen in Foundation custody has been observed doing so. Addendum: SCP-1961 was developed in ████ by the █████████ Research Group for the ███, with semi-official access to certain Foundation materials. Object was transferred to Foundation control in ████ after the results were deemed too dangerous to be used by [REDACTED]. Ongoing research has been monitored by [REDACTED] and [REDACTED] and continued Foundation control has been in dispute for ██ years. I am well aware that the O5 committee will do as it pleases, and I can only make suggestions, but I hope these will be taken under serious consideration. I request immediate transfer from SCP-1961, and recommend that all research on it be halted. If we wish to do what is best for humanity, SCP-1961 should be destroyed, and all specimens of SCP-1961-1 and SCP-1961-2 terminated. General █████ would have an army of 1961-1 units, supported by teams of 1961-2. He is insane. SCP-1961-1 specimens are not spies, "super soldiers" or our personnel given useful powers. They will turn against us at the first opportunity. The Foundation should not have helped create them, and we are damned if we continue.